CoStar Group is on a roll. The Washington, D.C.-based commercial real estate technology company was included on Fortune magazine’s “100 Fastest Growing Companies” list earlier this month and, this week, it announced it was hiring 730 researchers and software developers in Richmond, Va.
“What’s made CoStar successful over the last 30 years is that it has stayed true to its mission of creating transparency in the commercial real estate market by offering objective and comprehensive commercial real estate information through excellent technology and research,” said Chicago-based regional vice-president of sales Kim Pfahl. CoStar was founded in 1987 to conduct research to produce and maintain a comprehensive database of commercial real estate information. Its online services enable clients to analyze, interpret and gain insight on commercial property values, market conditions and current availabilities. “When you create more transparency in a market, you create more deals and outside investment and outside growth,” said Pfahl. Through organic growth and acquisitions, CoStar now includes a number of brands that deliver important real estate information and a suite of marketplace services. Its websites attracted an average of nearly 25 million unique monthly visitors in the second quarter of this year. LoopNet.com is the most heavily trafficked commercial real estate marketplace online, with more than 10 million registered members. Apartments.com, ApartmentFinder and ApartmentHomeLiving.com provide a resource for people seeking rental apartments and homes, and give property managers and owners a platform for marketing their properties. Through a partnership with Move, Inc., a subsidiary of News Corporation, Apartments.com is the exclusive provider of apartment community listings across Move’s family of websites, which include realtor.com, Doorsteps and Move.com. LandsofAmerica.com is the largest rural real estate listing network and BizBuySell is the leading business for sale marketplace. 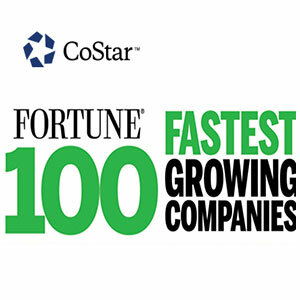 Fortune’s annual “100 Fastest Growing Companies” list looks at publicly traded companies and highlights the top three-year performers in revenue, profits and stock returns. Qualifying companies must have a minimum market cap of $250 million, a stock price of at least five dollars, and revenue and net income of at least $50 million and $10 million respectively in the last four quarters. CoStar employs about 2,700 people in North America and Europe and will significantly add to that total with the opening of the research centre in Richmond, which will occupy 125,000 square feet of space. CoStar is also making larger inroads in Canada, as it now has a presence in Toronto, Vancouver, Calgary, Edmonton and Ottawa. There’s a research team of 40 people in downtown Toronto and one to three research vehicles in the other cities capturing inventory and looking for sales and leasing availabilities based on signs. “The Canadian market is very fragmented,” said Pfahl. “There are a lot of little boutique data providers, but not a one-stop shop that will provide all of the services with a very advanced technology platform. CoStar senior director of Canada research David Eastep said the company is building a database from field research in Montreal, which should be the next major city to come on board. He projects that CoStar will cover all of Canada over the next five years. “We’ve received requests from London, Windsor and Halifax based on what our current clients are asking for, based on the deals they do in the marketplace,” said Eastep. CoStar is tracking 149,000 commercial real estate properties of all asset types, totaling a combined 3.3 billion square feet, in Canada. It’s making close to 15,000 database adjustments a day, based on real time changes to listings, transactions, rental rates, space availability and other factors, according to Eastep. “We provide valuable services to the market and our whole intention is to help the Canadian market succeed and grow,” said Pfahl. “Commercial real estate shapes the GDP of any economy to some degree. Pfahl said a national general manager who will be based in Toronto has been hired, but the person’s identity won’t be revealed until he or she starts in November.